» Blog Archive » What’s the best way to lead Swindon Council? Since August 2010 Swindon Council has been considering models of leadership and on the 16th December 2010 it agreed that the leader of the council should hold the post for four years, instead of being voted in annually by the councillors of the party with most seats. You probably won’t know anything of this because, apart from an obscure public notice in the daily paper and some leaflets in the Central Library, there has been no public discussion or publicity about it whatsoever. Geoff Reid of online forum www.talkswindon.org poses controversial questions about the way the town is run. its leader on a party political basis. Swindon’s voters will again be excluded from the discussion. In June 2001 The Link magazine was the only local media to discuss the possibility of Swindon electing a mayor to lead the town but our political elite, determined to retain power for itself, used a biased public consultation to prevent a public vote on the issue and in September 2001, the proposal to adopt the ‘Leader and Cabinet’ method of governance was nodded through the council without debate. 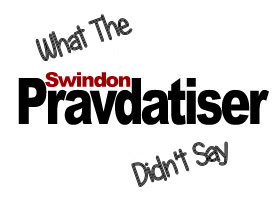 Nine years later, the Leader and Cabinet model of governance seems to have delivered little for Swindon apart than a noticeable decline in transparency and accountability and a corresponding increase in secrecy and resistance to public scrutiny. Far from delivering better democracy and encouraging public engagement with it, the council executive – the leadership – is now so secretive that few backbench councillors or members of the public know how millions of pounds of public cash is spent, lent or wasted. In 2009 the leadership became planner, developer and financier of the Wichelstowe development after its development partner ended a ‘collaboration’ deal with the council. The leadership is now funding over £100 million worth of infrastructure works directly from council bank accounts. Where’s the money coming from? North Swindon residents will be dismayed to learn that several £million of ‘section 106’ developer contributions from the building in their area has been slipped quietly south, depriving North Swindon of facilities that should have been provided. Swindon remains fascinated by the on-going WiFi debacle, in which the leadership secretly lent £150,000 of public money to a start-up business with no track record or credit history. As widely predicted, the project ran into trouble almost immediately forcing the council to ‘vary’ its progress measures to make it appear successful to justify lending it another £250,000. One year on the project appears stalled, Swindon has no ‘free’ WiFi, and the public loan remains unpaid. In January 2010 the leadership changed Swindon Commercial Services into an ‘Arms Length Management Organisation’ and lent it £4 million of public money. This short term loan of public money remained outstanding on its due date. ‘Austerity’ is upon us and the leadership wants to cut £45,000,000 (£45 million) by losing jobs and making ‘efficiency savings.’ I ask if it is morally right for collosal sums to be secretively spent on development projects while council workers are being made redundant, services reduced and assets are being readied for sell off? Leaving aside the leaders complaint about exclusion, council spending shows that ‘the money’ is there, but is being spent on the wrong things at the wrong time. The leadership should be focussed on people, and not funding expensive regeneration and vanity projects until economic conditions are better able to support them. The issues of council leadership, local governance, spending, competence, accountability, transparency and public engagement are inseparable and local democracy cannot reach its full potential for the public good if any of them are suppressed or controlled for political gain. Central Government has instructed Swindon Borough Council to take another look at its leadership model, including whether the leader should enjoy a ‘fixed term’ of four years. Predictably, our Councillors have, (with the notable exception of Cllr Wakefield in West Swindon), completely avoided discussing this with the electorate. Needless to say, governance changes were ‘nodded through’ council just as quietly in 2010 as they were in 2001, (with the Labour group abstaining from voting, rather than vote against the proposal), and the political status quo has, unsurprisingly been maintained, leaving the majority of Swindons 140,000+ voters remain unable to hold the council leadership properly accountable. Sometimes, the more things change, the more they stay exactly the same. Section 106 in North Swindon – where is it? The total is something of a mystery and in the case of huge development of over 10,000 homes in North Swindon which take place over a long period, it’s huge. Now former Swindon councillor and Oakhurst resident Stephanie Exell wants the borough council to explain how much has been agreed with developers over the years, what money has been spent and where. It’s a topic The Link has wanted to know more about for a long time and after discussion with her Stephanie submitted a Freedom of Information request in November. We eagerly await the response.